One month of print and digital access to North Carolina's essential legal newspaper. The subscription includes our Daily email alerts, notifications of our events so you can network with industry leaders, searchable archives and the digital edition. One year of print along with 24/7 digital access to North Carolina's essential legal newspaper. The subscription includes the print edition delivered to your home or business, our Daily email alerts, notifications of our events so you can network with industry leaders, searchable archives and access to the digital edition. 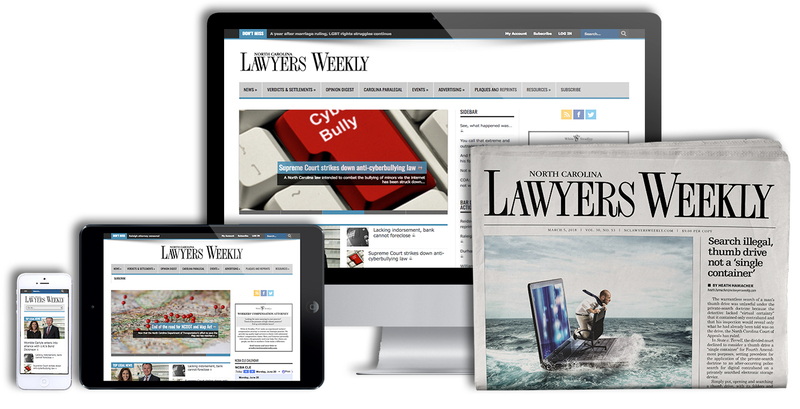 One year of 24/7 digital access to North Carolina's essential legal newspaper. Also includes our Daily email alerts, notifications of our events so you can network with industry leaders, searchable archives and access to the digital edition.